It's no secret that the British royal family has a penchant for the Caribbean sun—Princess Diana loved to escape the public spotlight in the West Indes, and Prince Harry has been spotted playing polo in Barbados and partying in Jamaica. So what is it about this region that has generations of royals flocking to its azure shores? Upon arrival at Cobblers Cove, a boutique Relais & Châteaux property in northwest Barbados, the answer is abundantly clear. The island, and indeed this hotel, exude a unique British-Caribbean charm that can't be found in popular U.S. vacation spots like the Bahamas. Men in white linen shirts perch atop wicker stools swirling rum punch, afternoon tea is served in the "drawing room" at 4 p.m. each day, and British accents drift through the open-air restaurant, a combination of chatting guests and Dido's dulcet tones. Although the Brits are wise to Barbados's charm, American travelers are yet to fully embrace the island en masse. The hotel's general manager, Will Oakley, estimates that 70% of guests are British, the majority of which are return visitors. Give the island is a five-hour flight from New York and three hours from Miami, it's surely a missed opportunity. Forget the Bahamas—here's how to vacation like royalty in Barbados. Cobblers Cove is nestled among a tropical palm-fringed garden in the island's northwest, distanced from the celebrity and tourist throng to the south. Perhaps it's this distance and tranquility that has guests coming back each year—there's a sense of homeliness and connection among staff and guests that is unmatched at ultra-modern developments and chain hotels. It's not lofty or overly exclusive. Rather, you feel like you're returning to a family vacation home; one where you know the best swim spots, who to ask for a killer cocktail, and where your half-finished book is sitting in the library. The hotel boasts 40 boutique suites, each decorated with coastal British-Caribbean character. Our top pick is the Camelot suit at the Great House, the most luxurious lodging with blue-and-white upholstered furniture, a canopy bed, and private rooftop with pool. Make the most of the complimentary amenities, including water sports and signature afternoon tea. Guests can book the Cobblers Cove private boat to try their hand at waterskiing, go standup paddleboarding, or snorkel with turtles off the coast. True to its 50-year British heritage, afternoon tea is served in the drawing room at 4 p.m. each day, with a selection of high tea-style sandwiches, pastries, and quality tea, of course. Weather can be unpredictable in Barbados, but Hunte's Garden is the perfect place to visit rain, hail, or shine. Created by master horticulturalist Anthony Hunte, the lush gardens are otherworldly: Tall palm trees form a dappled canopy, exotic flowers line the cobbled path, and classical music plays from hidden speakers, creating an ethereal symphony with chattering birds. The best way to see Barbados is by boat, and this local catamaran cruise company is a great option for those of us without a private yacht. Choose from a lunch, sunset, or private cruise, which includes hotel transfers, an open bar, and meals. All tours visit a submerged shipwreck puckered with coral and darting marine life, as well as snorkeling spots with turtles and rays. Barbados is peppered with pastel historic buildings, but it's well worth booking a guide to show you around. Miguel Pena, general manager of the Barbados National Trust, offers private historic tours that can be arranged via Cobblers Cove. 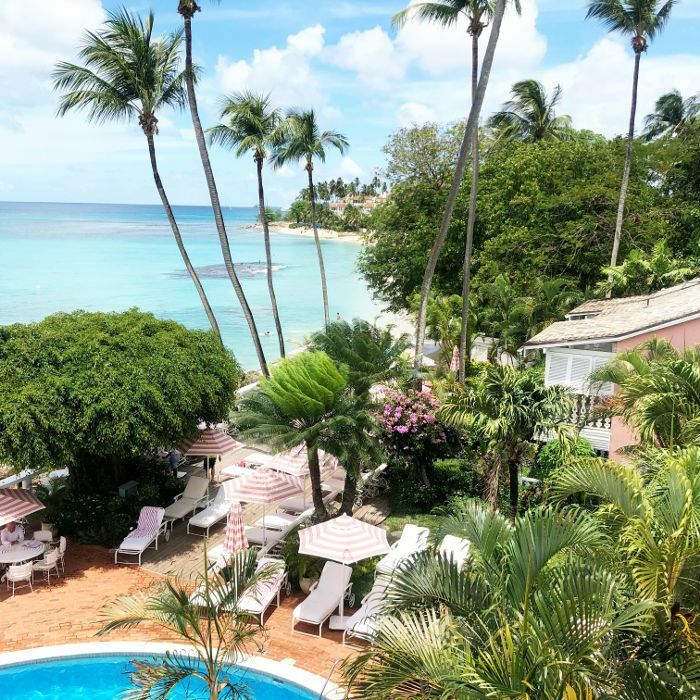 Though the itinerary is customized to your interests, there are a few standout locations not to miss: Start in Speightstown, a beautiful historic area in the northwest that was settled in the 1630s. Stop by Arlington House and spot the Noel Roach pharmacy, a piercing blue building surrounded by local fruit vendors. Venture to the lookout at Cherry Tree Hill, then stop at Morgan Lewis windmill, before driving south to see some of the rugged beaches. Trust us: If you only book one sightseeing trip during your vacation, this should be it. Make like Prince Harry and watch a polo match during your trip to Barbados—it's one of the most popular sports on the island and dates back to 1884 when cavalry officers brought the sport from Great Britain. Tour the vibrant fish and vegetable markets and pick out fresh produce to cook with the head chef at Cobbler's Cove. You'll visit the Village Bar at Lemon Arbor to sample pudding and souse, barbecue pork, and local rum, and then return to the hotel to cook the produce with the chef. This 350-year-old abbey is a must-see. It's one of just three Jacobean-style mansions remaining in the Western Hemisphere, built on 400 acres of sugar cane fields, tropical gullies, and mahogany forests. Stop by the distillery to taste its unique rum, which has hints of cognac. The Barbados culinary scene is fantastically varied. There are world-class fine-dining restaurants, complete with starched linens and a dress code, and quaint rum shacks and food trucks, the perfect post-beach pitstop. You don't have to commit to one or the other; in order to truly appreciate the flavors of Barbados, zigzag the island and experience both. Cancel your Friday night plans—Oistins Fish Fry is the place to be in Barbados. Located in the island's south, the active fishing town comes alive with abundant food stalls, incredible local cuisine, and a gaggle of locals and tourists. This award-winning restaurant lives up to the hype. Chef Jason Joseph and his team source ingredients from local suppliers, including their on-staff fisherman. Start with the White Lady cocktail, a Cointreau citrus creation favored by former owner Alan Godsal, and be sure to try the West Indes Chicken Curry, a local dish with homemade mango chutney and roti. The open-air restaurant is upmarket but not pretentious—though it's worth noting the dress code when you're packing your luggage. This local institution doles out juicy fish sandwiches that shouldn't be missed. The low-key beachside food truck's legendary Blue Marlin Cutter is served on salt bread with Scotch bonnet sauce. Former hotelier and author John Chandler hosts intimate dinners at Lancaster Great House, a historic plantation residence. Alternatively, opt for Planters Lunch buffet, a magnificent local spread hosted on Sundays, which features West Indes dishes with incredible floral displays. Going all-out? Lone Star is regarded as one of the best fine dining experiences on the island, serving European-Caribbean fusion cuisine. This annual food and rum festival takes place in October in 2018 with a host of culinary events. Witness the Oistins Bay Gardens Cook-Off, sample food and rum pairings at the Signature Rum Event, or book a table at one of the fine dining events hosted by leading international and local chefs. Planning a trip? Follow Meghan Markle's lead and pack these four items in your carry-on to make coach feel like first class. This press trip was hosted by Cobblers Cove. The editor's opinions are her own.